(hereinafter "AUTHENTIC JAPAN"), accessible via the Internet from the url www.kinase-boutique.com whose purpose is to allow Internet users visiting it not only to discover the Japanese province of Niigata but also to buy products from this region and other provinces of Japan (sake, rice, grocery products, tableware, etc...) imported from Japan (hereinafter the "Site"). These general terms and conditions of sale (hereinafter referred to as the "General Terms and Conditions of Sale" or "GTC") define the rights and obligations of the parties in connection with the sale by AUTHENTIC JAPAN of products manufactured by AUTHENTIC JAPAN's business partners (hereinafter referred to as the "Products") to consumers using the Site (hereinafter referred to as the "Customer"). It is specified that purchases of Products on the Site are reserved for non-commercial individuals who are over 18 years of age and have full legal capacity. 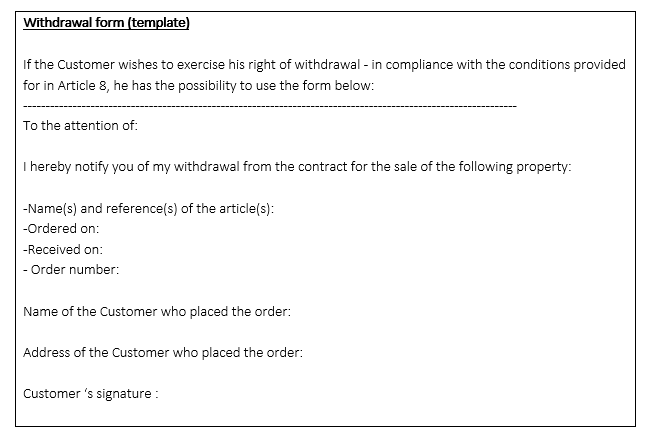 These General Terms and Conditions of Sale are supplemented by the general terms and conditions of use of the site and the privacy and confidentiality policy and constitute, together with the summary order form and invoice communicated to the Customer, all the contractual documents that are binding between the parties to the exclusion of any other document. AUTHENTIC JAPAN reserves the right to modify the content of the General Terms and Conditions of Sale at any time. In such a case, the new version of the General Terms and Conditions of Sale will be published on the Site and will apply to orders for Products placed after their publication. The applicable General Terms and Conditions of Sale are those in force on the Site on the date of the order placed by the Customer. The Products offered for sale by AUTHENTIC JAPAN are those that appear on the Site, at the time of its consultation by the Customer, and within the limits of available stocks. AUTHENTIC JAPAN reserves the right to withdraw Products from sale at any time. AUTHENTIC JAPAN takes the greatest care in the presentation of the Products and each of the elements composing them on the Site in order to meet the requirements of article L.111-1 of the Consumer Code. Nevertheless, the photographs illustrating the Products are only indicative and do not fall within the scope of the contract. Indeed, if every effort is made to ensure that the hue of the Products and each of their components, whose photos are displayed on the Site by AUTHENTIC JAPAN, are faithful to the original products, variations may occur, particularly due to the technical limitations of the color rendering of computer equipment. Consequently, AUTHENTIC JAPAN cannot be held responsible for errors or inaccuracies in the rendering of photographs or graphic representations of the Products or the elements that make up them presented on the Site. The Customer is invited to consult the description of each Product to know its essential and exact characteristics. Only Products appearing on the Site in clear and/or indicated as available and/or not sold out on the day of consultation by the Customer are offered for sale. To this end, the Customer is informed when placing his order of the availability of the Product he wishes to select. In the event of questions relating to the unavailability of the Product, the Customer may contact the Customer Relations Department in accordance with the procedures indicated for this purpose. However, if exceptionally the Product becomes unavailable after the validation of the order, the Customer will be informed as soon as possible by email or telephone of the postponement or cancellation of his order. In the event of the Customer's disagreement with a postponement of his order, AUTHENTIC JAPAN shall refund the sums paid within thirty (30) days of the notification of refusal sent by the Customer. The Customer may view the various Products offered for sale by AUTHENTIC JAPAN on the Site. The Customer can navigate freely on the various pages of the Site, without being committed to an order. To be able to place an order, the Customer must have an active account. You can create an account online at any time, from the "Create an account" tab. When creating his account, the Customer accepts all the General Terms and Conditions of Sale by checking the box provided for this purpose. The account creation can be done either through the Customer's Facebook or Google+ accounts, or by using a form provided for this purpose. When registering using the form, all new Customers must fill in the fields proposed and indicated as mandatory to create their profile, which will be accessible in the "My Account" section. The Customer must accurately complete the form provided, on which he must mention the information necessary for his identification. The Customer undertakes to correctly complete the said form, and in particular to provide only accurate, up-to-date and complete information. The Customer is also required to choose a password. This password must contain at least 8 characters, including at least one letter, one number and one special character. The Customer acknowledges that he is fully responsible for maintaining the confidentiality of his identifiers and access codes. This information will be used later to identify you on the Site. The Customer acknowledges that he/she is fully responsible for maintaining the confidentiality of his/her access codes. Thus, in the event of fraudulent use of said identifiers, the Customer undertakes to immediately inform AUTHENTIC JAPAN of the unauthorized use of his account. The Customer is solely responsible for the use of his account. Any connection or transmission of orders made using the Site shall be deemed to have been made by the Customer and under his sole responsibility. The provision of personal information collected in the context of distance selling and marked with an asterisk is mandatory, this information being necessary for the processing and delivery of orders as well as for the preparation of invoices. AUTHENTIC JAPAN cannot be held responsible if the data relating to a Customer's registration does not reach it for any reason for which it is not responsible (for example, a problem with connection to the Internet or mobile Internet due to any reason whatsoever at the Customer's premises, a temporary failure of its servers, etc.) or if it arrives illegible or impossible to process, (for example if the Customer has computer equipment or software environment that is unsuitable for registration). The Customer who wishes to place an order selects the different Product(s) of his choice by clicking on "Add to cart". - continue the selection of Products by clicking on "CONTINUE MY PURCHASES"
- complete the order by clicking on "ORDER AND PAY". It is specified that the Products are intended for the Customer's personal use, without any direct connection with the Customer's professional activity. In this respect, the Customer's attention is particularly drawn to the fact that he may not order more than 6 products of the same reference per month. In the event of an order exceeding the above number, the order will be considered null and void. After having read the summary order form and before being able to choose the proposed payment method, the Customer must click on "Validate my basket and pay" to validate his order. By clicking on the button "Validate my basket and pay", the Customer declares that he fully and unreservedly accepts the General Terms and Conditions of Sale. - Refusal to authorize payment by credit card from banking institutions. The sale will only be considered final after payment of the corresponding price and the sending to the Customer of the confirmation of acceptance of the order by AUTHENTIC JAPAN by e-mail. The Customer may only place an order for Products for delivery in metropolitan France and Corsica and any order mentioning another place of delivery will be rejected. Without prejudice to the Customer's right to exercise its right of withdrawal, once validated, an order may not be cancelled by the Customer without the prior written consent of AUTHENTIC JAPAN. As orders are final and irrevocable, any modification request made by the Customer is subject to AUTHENTIC JAPAN's acceptance. AUTHENTIC JAPAN undertakes to deliver a Product in conformity with the one ordered. Orders for Products are delivered, during working hours and days, to the address indicated by the Customer, accompanied by a delivery note. The Customer has the possibility of having the Products delivered to an address other than his own. The delivery times for the Products are those indicated on the Site on the day of the order. In the absence of any indication on the Site, AUTHENTIC JAPAN undertakes in any event to deliver the Products within a maximum period of thirty (30) working days from the day following payment of the order. It is specified that orders placed on the Site on Friday afternoons from 12 noon, Saturday or Sunday will be processed on the following Monday. Orders placed on the Site on a public holiday will be processed on the next business day. Each delivery is deemed to have been made as soon as the Products are made available to the Customer by the carrier, as evidenced by the control system used by the carrier. The Customer is informed of the departure of his order by sending an e-mail summarizing the Products sent and informing him of the tracking number and the means enabling him to know the progress of the processing of his order. The Customer is invited to regularly check his order tracking and to contact AUTHENTIC JAPAN's customer service for any questions or problems. In this respect, AUTHENTIC JAPAN provides the Customer with an Azure number (cost of a local call from a fixed line), which is indicated in the order confirmation email received by the Customer after confirmation of his order. In the event that the Customer is absent when the Products are delivered, AUTHENTIC JAPAN will inform him/her by any means of his/her choice where he/she can withdraw his/her Products. In the event that the Customer does not collect the Products within thirty (30) days of AUTHENTIC JAPAN's notification of the terms and conditions for the withdrawal of its Products, the order shall be considered cancelled and AUTHENTIC JAPAN shall retain the amount of the sums paid by the Customer for the order in question. AUTHENTIC JAPAN and the carrier may under no circumstances be held liable in the event of an impossibility of delivery, due to an imprecise delivery address. In the event of force majeure, preventing partial or total delivery, the delivery time indicated to the Customer shall be adjusted according to the proven duration of the force majeure. Are considered as cases of force majeure: strikes, road, rail or air network blockages and acts due to bad weather. Without prejudice to the Customer's rights relating to the legal warranty attached to the Products, it is agreed that after a period of fifteen (15) days following the delivery date and failing to comply with these formalities, the Products shall be deemed to be in conformity and free of any apparent defect and no claim shall be validly accepted by AUTHENTIC JAPAN, unless there is a legitimate reason. In the event of lack of conformity of a delivered Product, the Customer may return it to AUTHENTIC JAPAN at the address indicated by AUTHENTIC JAPAN when ordering in its original state, imperatively bearing the original labels and/or accompanied by the original packaging, the delivery note and the invoice. The Customer must also inform AUTHENTIC JAPAN within 15 days of the delivery date. To do this, the Customer must complete a feedback form available in the "contact" section of the Site and describe the non-conformity of the Product. - the exchange of the non-conforming Product, insofar as this Product is available in stock. Prices are indicated in euros and inclusive of VAT, excluding preparation and delivery costs. The Value Added Tax is the one in force on the French metropolitan territory on the day of the order. The sale price of the Products is the one in force on the Site on the day the order is placed. The fixed amount of contribution to the preparation and delivery costs is communicated to the Customer on the order summary form, before validation of the order. AUTHENTIC JAPAN reserves the right to modify its prices at any time. The price is due and payable at the time of order. Payment is made by credit card. AUTHENTIC JAPAN accepts all major types of credit cards (Carte Bleue, VISA, Mastercard). AUTHENTIC JAPAN uses the Sherlock's secure payment system managed by LCL Bank as well as the 3D Secure system, which is an online payment security system created by international issuers Visa and MasterCard and implemented in France in 2008. This is a procedure for authenticating the cardholder, to ensure that it is the cardholder who makes the payment on the Internet. The security of the transport of card data is ensured by 128-bit SSL (Secure Socket Layer) encryption and the payment page is hosted on a bank server that ensures the integrity and confidentiality of the data collected. Each payment systematically triggers an authorization request to your bank to verify the validity of the card details. All Products remain the property of AUTHENTIC JAPAN until full and effective collection of their price at maturity. Consequently, the Customer undertakes not to resell any AUTHENTIC JAPAN Product until it has been paid in full to AUTHENTIC JAPAN. In addition, the Customer shall be liable for any losses, deterioration and depreciation that may affect the Products delivered, for any reason whatsoever, until they have been paid in full to AUTHENTIC JAPAN. In accordance with the provisions of Article L. 121-21 of the Consumer Code, the Customer has a withdrawal period of fourteen (14) clear days within which to return to AUTHENTIC JAPAN, without having to indicate the reasons for his decision, the Product(s) he has ordered if the latter does not give him(them) satisfaction. This period starts from the day of delivery of the order. The Customer is free to choose the shipping method of his product and to subscribe or not to subscribe an insurance in case of loss, theft or destruction of his package. It is recommended to the Customer to return his packages in "colissimo followed by signature". It will be the Customer's responsibility to prove receipt of the package at AUTHENTIC JAPAN's premises in the event of a dispute. AUTHENTIC JAPAN does not cover any of these costs or the cost of transport and cannot be held responsible for the non-receipt of the Customer's package. The Site advises Internet users to opt for a tracked shipment of the package. In general, all costs and risks related to the return of the product are the responsibility of the Customer. AUTHENTIC JAPAN does not accept parcels with postage due. If the above conditions are met, AUTHENTIC JAPAN will refund the Customer, the sums corresponding to the Products acquired by him, within a maximum period of fourteen (14) days following the date on which the Products returned to AUTHENTIC JAPAN by the Customer having exercised its right of retraction will have been received by AUTHENTIC JAPAN. The refund is made directly to the Customer's account linked to the credit card used to order the Products. In the event of a partial return of an order, AUTHENTIC JAPAN will refund the Customer the amount of the shipping costs (outward) in proportion to the total amount of the order. In the event of a total return of an order, AUTHENTIC JAPAN will refund the Customer the total amount of the shipping costs paid during the order. All products supplied by AUTHENTIC JAPAN benefit from the legal guarantee of conformity provided for in Articles L. 217-4 to L. 217-14 of the Consumer Code or the guarantee against hidden defects provided for in Articles 1641 to 1649 of the Civil Code, provided that their use has been normal and that maintenance instructions have been followed. - He can benefit from it independently of the commercial guarantee or any manufacturer's guarantee that may be granted. The Customer may implement the legal guarantee against hidden defects of the thing sold provided for in Article 1641 of the Civil Code. In this case, he has the choice of returning the thing and getting the price back, or keeping the thing and getting part of the price back in accordance with article 1644 of the Civil Code. The seller delivers a good in conformity with the contract and is liable for any lack of conformity existing at the time of delivery. He shall also be liable for defects in conformity resulting from packaging, assembly instructions or installation where the latter has been charged to him by the contract or has been carried out under his responsibility. 2° Or if it has the characteristics defined by mutual agreement between the parties or is suitable for any special use sought by the buyer, brought to the attention of the seller and which the latter has accepted. Lack of conformity which becomes apparent within 24 months of delivery of the goods shall be presumed to exist at the time of delivery, unless proven otherwise. For second-hand goods, this period is set at six months. The seller may rebut this presumption if it is not compatible with the nature of the goods or the alleged lack of conformity. In the event of lack of conformity, the buyer chooses between repair and replacement of the goods. However, the seller may not proceed according to the buyer's choice if this choice entails a cost that is clearly disproportionate to the other method, taking into account the value of the goods or the importance of the defect. He is then required to proceed, unless impossible, according to the method not chosen by the buyer. If repair and replacement of the property is not possible, the buyer may return the property and have the price returned or keep the property and have part of the price returned. 2° Or if this solution cannot be done without major inconvenience for the latter given the nature of the property and the use it seeks. However, the sale may not be cancelled if the lack of conformity is minor. The action resulting from the lack of conformity shall be barred after two years from the date of delivery of the goods. The provisions of this section do not deprive the buyer of the right to bring an action resulting from redhibitory defects as provided for in Articles 1641 to 1649 of the Civil Code or any other action of a contractual or non-contractual nature recognised by law. The seller is bound by the warranty for hidden defects in the thing sold that make it unfit for the use for which it is intended, or that reduce this use so much that the buyer would not have acquired it, or would have given only a lower price, if he had known them. In the case of articles 1641 and 1643, the buyer has the option of returning the thing and having the price returned, or keeping the thing and having a portion of the price returned. The action resulting from the fundamental defects must be brought by the purchaser within two years of the discovery of the defect. AUTHENTIC JAPAN cannot be held liable for any inconvenience or damage inherent in the use of the Internet network, such as the interruption of service or the presence of computer viruses. AUTHENTIC JAPAN cannot be held liable in the event of non-performance or improper performance of the contract due either to the Customer's fault, or to the insurmountable and unforeseeable fault of a third party to the contract, or to a case of force majeure. In accordance with Article L. 3342-1 of the Public Health Code, the sale of alcohol to minors under the age of eighteen (18) is prohibited. The Customer undertakes to be 18 years old when placing his order on the Site. In the event that any of the terms of the General Terms and Conditions of Sale are considered illegal or unenforceable by a court decision, the other provisions shall remain in force, unless the invalidated obligation is an essential obligation whose removal or cancellation would prevent the continuation of these entire General Terms and Conditions of Sale. The fact that AUTHENTIC JAPAN refrains from demanding the execution of any of the clauses of these General Terms and Conditions of Sale or from exercising any right granted to it by these General Terms and Conditions of Sale shall in no way be considered as a definitive waiver of this right, nor shall it prevent it from subsequently continuing its execution, regardless of the duration of this abstention. In accordance with the provisions of the Consumer Code concerning "the mediation process for consumer disputes", the Customer has the right to use the mediation service offered by AUTHENTIC JAPAN free of charge. The mediator in consumer law thus proposed is MEDICYS. - by postal mail: MEDICYS- Centre de médiation et règlement amiable des huissiers de justice- 73, Boulevard de Clichy, 75009 - Paris. In accordance with Article L 612-2 of the Consumer Code, one of the preconditions for MEDICYS to examine the dispute is the following: the consumer must justify having tried to resolve his dispute directly with AUTHENTIC JAPAN's Customer Service beforehand, by a complaint submitted by mail or e-mail in accordance with the terms defined above.